Ahhhh, the cheese..... It's all wonderful, but I was especially looking forward to seeing the first cheese plate. You made my day. Sign me up for a size medium. Lucy, that looks like a well-loved and cherished tart pan. Is it Le Creuset? I've never seen a round pan like that over here. It looks like the finish is chipping off? Does that change the way you handle or use the pan? Smithy, nice eye! I bought it along with two other for 10 Francs (about €1,50) for the lot at a vide granier (that's a garage sale) two weeks after we arrived in France. These little old ladies were trying to get rid of a whole lot of stuff, I needed something to cook in for the two of us, the price was right. I didn't even look underneath until I got it home. It was old when I got it, and I use it all the time. Basically I try and keep Loic from leaving it to soak, and we don't run it though the machine. Otherwise I use it on the cook top and also in the oven. If I served courses as you do, I think I'd spend all the time in the kitchen instead of with the guests. Do you? If not, how do you get away from it? For instance, do you usually have a lot of the work done in advance (the quail ready for the spit), are you an especially efficient cook, or is it a bit of both? Basically I do what I can beforehand. That means shop, and whatever I manage to fit in before the guests arrive. When I am in the kitchen I move rather quickly and try and keep my time in the kitchen to a minimum. This also means choosing dishes that aren't going to be difficult to execute or risk getting ruined if I have to leave them. I knew that I could basically turn down the heat down low once I had the salad ready for the gizzards, and hold it there for awhile. This way I could go out and listen to Mathieu's stories a bit and choose a good moment to serve the salad. I also break tasks down into much smaller ones and space them all out so that I can stop at any moment if I need to. 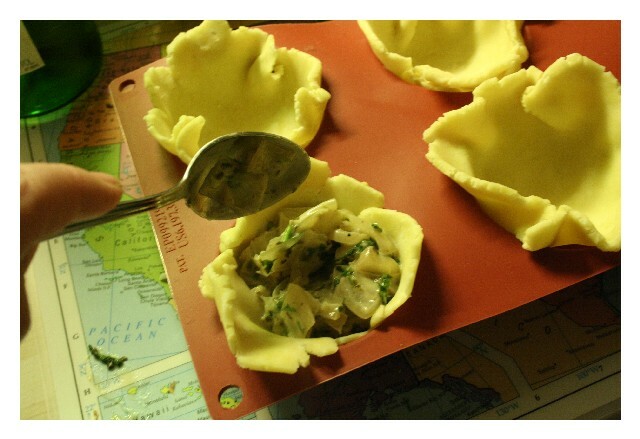 For instance, making the pastry honestly takes about 1 minute, I know the recette and I just make it. I just put it in the fridge and it's done. I make sure I work cleanly so that mess doesn't slow me down. I use plastic placemats to protect my work space and then empty them off into the waste basket just as soon as I am done with a task. The last thing is that Loic is a really good backup and great conversationalist - if I do need to slip away the guests hopefully don't feel neglected. We can't serve something cooked just right without slipping out here and there, now can we? 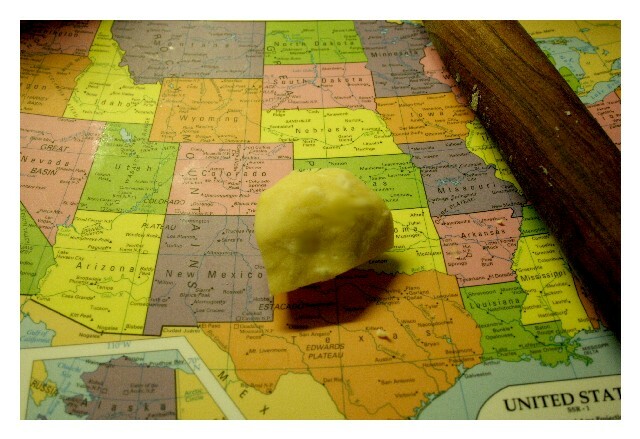 Swisskaese, I did not put mustard in the butter that I smeared on the birds. Lets see. It was salt, butter, cider vinegar from normandy, and a spoonful of a spice mix I have on hand at all times with the following proportions: 3 paprika, 1/2 ground dried chipotle, 1 salt, 1 black pepper, 1 garlic powder, 1 dried shallots, 1 herbes de provence. Lindak, the rotisserie is built into the oven. It's great and I love it because with my little oven everything browns up nice and evenly. I have roti'ed just about everything I could attach to the spit. Leg of lamb does quite nicely, game birds of all kinds, rabbit, and of course my favorite, the plain old chicken. Dinner tonight was very very simple. First we played around with the cocktail shaker and made something with the vin de noix. It was pretty, vin de noix maison, peach juice, a touch of armagnac and an egg white. This was pretty good with peanut cheetoes. 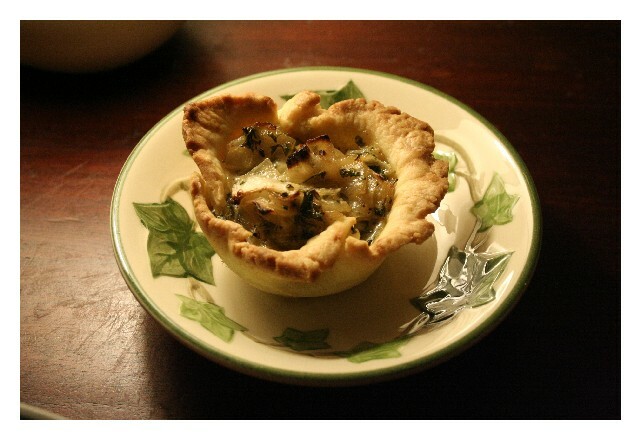 I think it might have also gone well with roquefort tartelettes. This I will save for a rainy day. 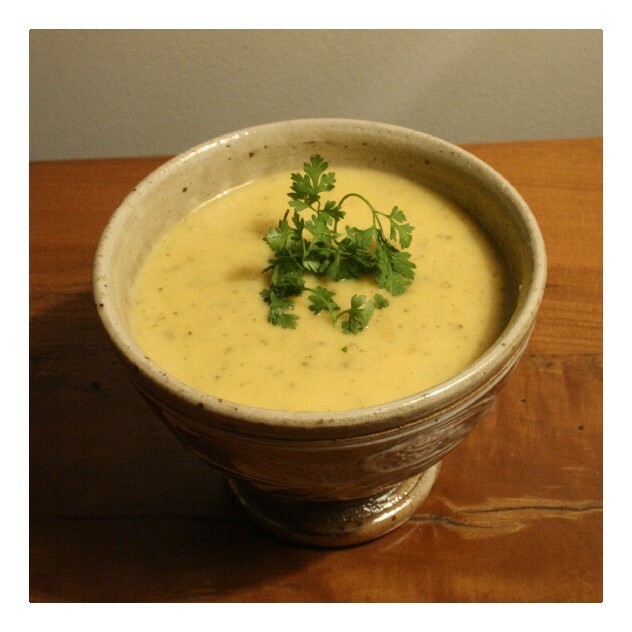 Soup consisting of: carrots, shallots, garlic, a couple of small potatoes, fish stock from yesterday, white wine, lemon, creme fraiche, salt, pepper and spice mix (above), pureed like I like it. It had a nice balance and went well with the country bread we had leftover from lunch. I'm off to bed, tomorrow morning I have a task to complete before leaving for the market - I have to debone a rabbit and a lapin de garenne which is a wild bunny but not a lievre. This will be placed to marinate for the day. I am doing this for a terrine that I will put together tomorrow night and hold until our Thanksgiving feast, since it has to sit at least 5 days before it is at its best. (our Thanksgiving feast is held on Saturday to accomodate guests (Thursday is not a holiday here). Lucy, thank you so much for blogging again. All your posts are truly wonderful and add so much to eGullet. Sunday lunch looked absolutely delicious. And the cheese....oh I adore cheese. I can hardly wait for each new post, je suis vraiment heureuse! Merci en avance. Tell me more. Googling reveals it as a popular snack in Israel, called "Bamba". Same thing? 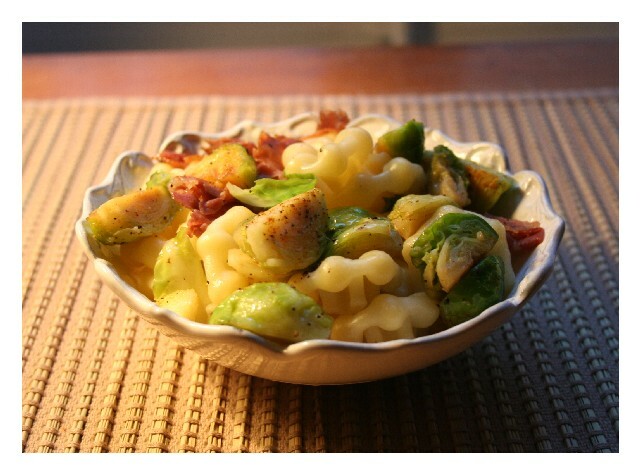 And btw, Lucy...your blog was my gold-standard that I tried (and failed) to hold myself to when foodblogging. I love your photos and your menus! 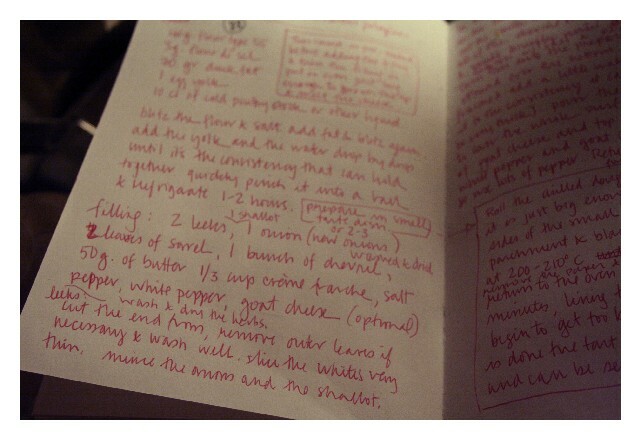 Lucy, I'm curious, is there a specific reason/benefit for which you write your recipes on translucid paper? Lucy, good on you for blogging this week, especiallyl after last week . Those quail. Farm raised? Wild? Seaonal item? What are they wrapped with? Did you wrap them? Tell me more about those quail! 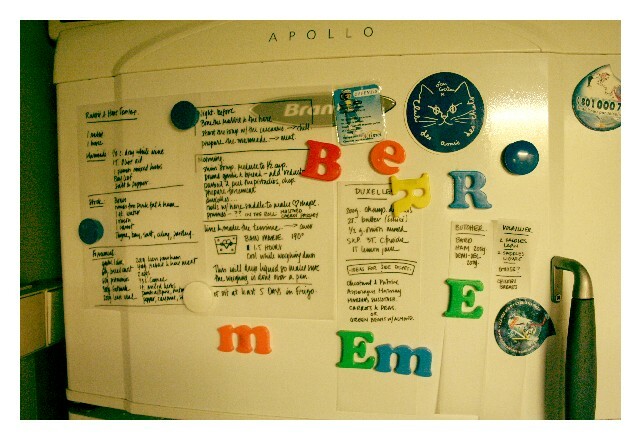 The 'fridge alphabet: did you plan on spelling any words? I see "beurre" (minus the U, of course) and meme (but that is pushing it...). Or was it an accident? Lucy, thanks so much for blogging again! You are so talented! Your blog reminds me of the Thanksgiving I spent in Germany a number of years ago... I organized a TD meal for all my german and american buddies. Made dressing in a huge bucket, and cooked turkey in kitchens on multiple floors - four in all. I spent the day riding the elevators from floor to floor, basting all the while. I didn't have "normal" turkey condiments, so I trussed the turkeys with toothpicks and dental floss! It actually turned out quite well. My German friends were impressed, and my American friends felt like they'd had a bit of home. BTW, we'd bought the turkeys at an American military base.... a bit of home while so far away! Dinner looks delicious. I am going to have to try making the soup. I am laughing about the peanut cheetos because I believe that this snack was invented here in Israel. It is called Bamba (Click on Brands => Snacks => Bamba) and is given to every Israeli child at birth. One could be so bold to call it a national snack. 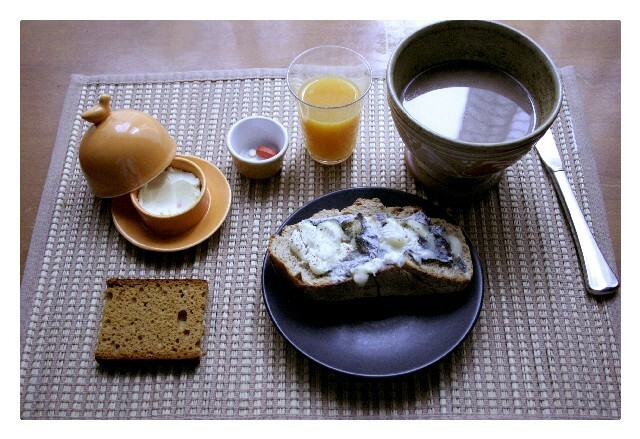 This morning breakfast was Coffee and a Selles-sur-Cher tartine with pepper and fleur de sel. Sorry the picture's so blah. I suppose this is an example of a photo taken by someone in a hurry! I also sampled a piece of some honey spice bread (pain d'epice pur miel) which I was thinking of cutting into strips and toasting to serve as a garnish with a foie gras au torchon. It is a nice compliment to the liver. The last time I had it was at Chez Pierre, It was very lightly toasted, enough to make it crunchy and it was a nice accompaniment to the fois gras. Not too sweet. Cut into rather symmetrical strips. I tossed the slice in the oven while it was still hot from heating up my tartine. The bread came out very soft. I let it sit for a few minutes and it got crunchy again. I was thinking with this in mind that I might put the strips into some kind of shape or mould while it's still warm and let it harden that way. In addition, I took vitamins because I've been fighting off a cold, and a small glass of peach juice. I have to really squeeze everything I can out of today, in addition to some kitchen tasks that must be done now, it is my day to hurry up and finish up a couple of projects I've been working on. Most everything is closed today, except one of my butchers. 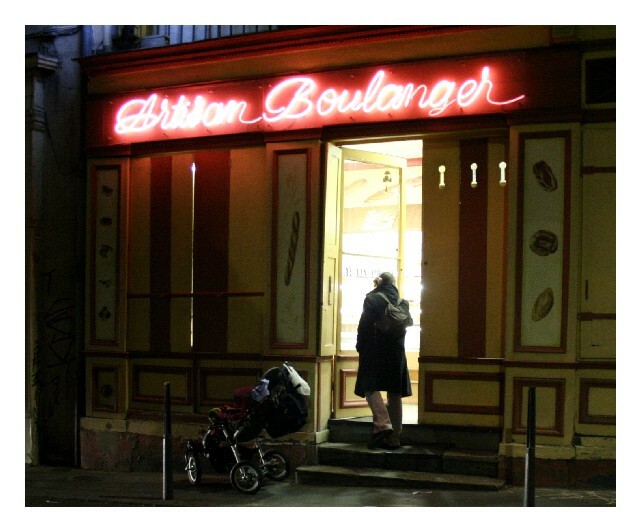 The library, the St. Antoine Market, the Halle on my square, all of the neighborhood grocery stores except for one imports shop, also my boulanger. Monday is kind of dead in my neighborhood. I also have to write a letter. My work these days is taking place at various places in the city. As for the peanut cheetos, this is just one of the many flavors that they make here. As far as I know, this product is French. The aperetif here is often accompanied by simple snack things like chips or nuts, or cheetoes. The difference here is that they are not normally eaten by the handful, nor do people reach for the cheetoes or chips when they are hungry. People sit around with their champagne and talk, and then take one or two of these and eat them slowly, letting them melt on their tongues. This struck me as hilarious the first time I went to friends' homes and saw them serve these snacks, first because I was under the wierd misimpression that since the French love food they'd never serve anything like cheetoes with an aperetif! But it's quite common here, among all kinds of folks, and certain flavors go really nicely with champagne. The quail were raised by this amazing woman I recently met, who's family raises and sources all kinds of birds and game animals, in addition to selling fresh hunted game during the season. The more I learn about butchers, the more I am discovering the specialty butchers - The volailler - who works only with the various birds and small game animals. She works the St. Antoine market with her husband and son. The quail I served yesterday were just your average farm raised quail, although there were tons of lovely wild ones, and wild forest pigeon, bigger birds as well, so much to choose from - and the wild ones cost more because they have to be caught. If my husband hadn't been there saying 'NO' every time I even looked at the other birds, I probably would have shelled out the cash for something more...wild. Sometimes when we're strapped for cash, my husband gets antsy and he thinks that me asking questions about this or that indicates my intention to buy. He begins to panic when I just point my finger at a bird which costs a lot more. I soothed him by saying - 'Alright, that will be all', and then as he exchanged pleasantries with her husband, I asked for the woman's phone number on the sly. Her work is very interesting to me. She barded them, wrapped them in bacon and tied 'em up for the spit. They cost about €2 each. Silly Disciple: I have been writing all of my notes for Thanksgiving on the papier calque for one reason: A bic flair pen feels so nice running across this paper that it's a luxury just to watch ideas flow out so purely onto it. I love the way the pen glides across the paper so smoothly. My father who was an artist and also an ad man, had enormous stocks of many kinds of paper. I was allowed to use any of his paper stocks when I was growing up and often found myeslf drawn to that particular paper because for me it was the most fluid idea paper. I've forgotten what it was called but it was specifically made for getting ideas quickly onto the paper. Simple clear notes came though best on this kind of paper, no resistance from the grain, never a patch of ink I didn't mean to put there, I didn't ever feel like I was scratching to get anything down. Sometimes, when you are pushing to materialize something that hasn't gelled yet, you want to physically "work" out ideas onto paper. You want to feel the resitance of the grain in the paper, or use a pencil or an implement that has more or less of a hardness or textural quality that will reassure you of the idea that your idea will take shape. In combination with your idea, and the light, and your subject, evenutally you work through to a final drawing in an almost acoustical way, like a bat navigates its way though a cave. Other times you just want plain ideas which are already clear to take their visual form, without the sound. Using this paper, the kind with no resistance, is best when your idea contains very little noise. When I'm planning out a meal like Thanksgiving, much of my planning is just combining or rehashing ideas and steps that have already been well thought out and already executed in the past. In that way it's much easier to just get them down with a flair pen on a piece of calque. There are merits to all of the papers, of course. Onion skin is also a clear fav of mine. I have also been really enjoying some cotton writing paper for letters which feels very good, but for the opposite reason - it's full of a rhythmic texture that goes well with the cadence of recounting stories. About the fridge. A few weeks ago I was supposed to remember something so I put "remember" on the door of the freezer. I think it was to remember that speculos flavored ice cream and toffee syrup makes a person fat. The letters have remained on the door long after the ice cream is gone. 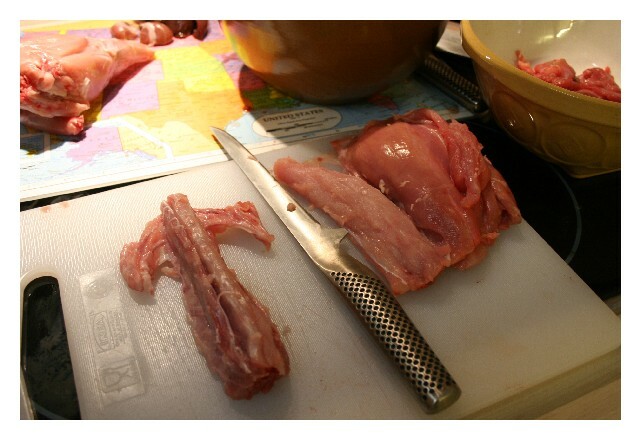 The wild and farm raised rabbits have been boned, the stock is on and the meat is marinating. The two rabbits were a bit diferent in character, both being de-boned side by side. I found that the wild rabbit seemed to resist my efforts as if even now it would not like to be handled. 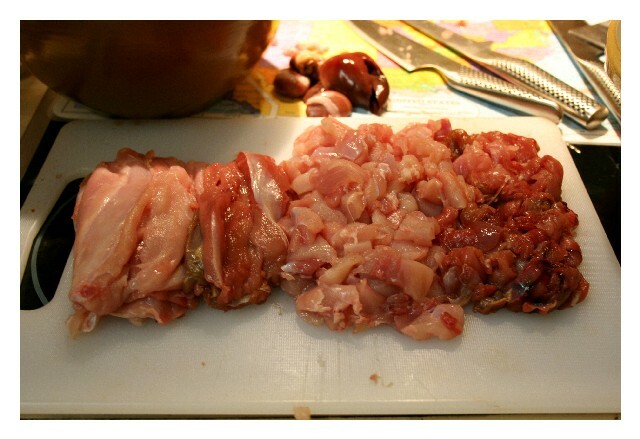 The meat showed signs of its past life - the rabbit had been a pretty active one, with dark red meat showing that the muscles were completely engorged much of its life. 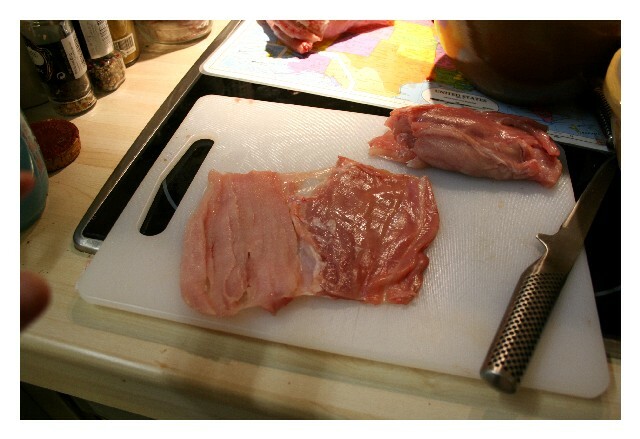 The contrast against the farm raised rabbit was striking - the farm raised rabbit's soft flesh melted like butter as I simply slid my knife along and removed it from the bones. The wild rabbit resisting all the way and with much more prominent tendons. 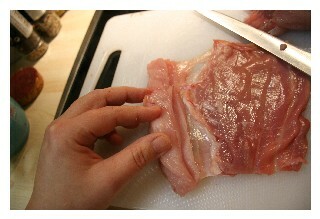 I didn't get nearly as much meat from the wild rabbit as from the farm raised one. Here you see the farm raised saddle meat, the wild saddle meat, the farm raised leg meat, and the wild leg meat. Note the much darker color from the wild animal, since it was much more active in life. They smelled different too. Along the back on the saddle there is a large piece of meat that I flattened and will use both that and the muscle that wraps down along the side to construct the decorative center of my terrine. You cut it and roll it out from one end to the other to get it flat. The darker side is the muscle that runs down the front side of the rabbit. 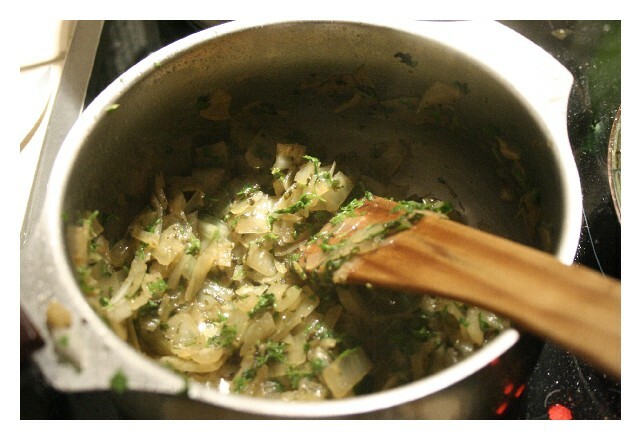 Chopped meat from the legs and flattened saddle meat of both animals, dry white wine, olive oil, bay leaf, mixed herbs, salt and pepper. 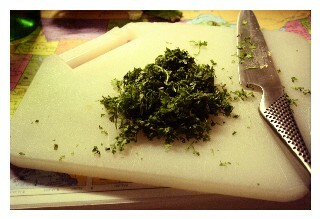 thyme, bay, parsley, celery root. 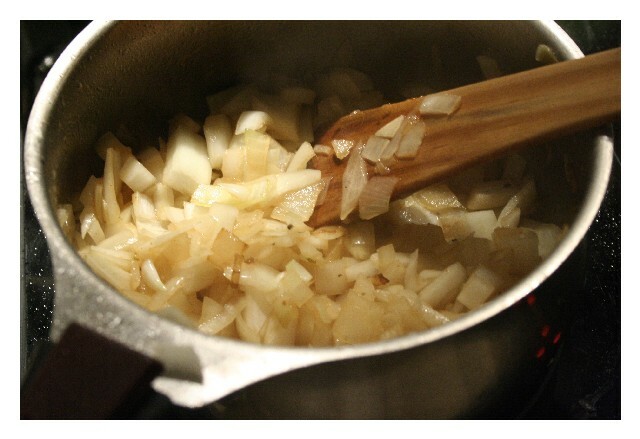 -skim for the first five minutes, and then simmer on low for awhile. 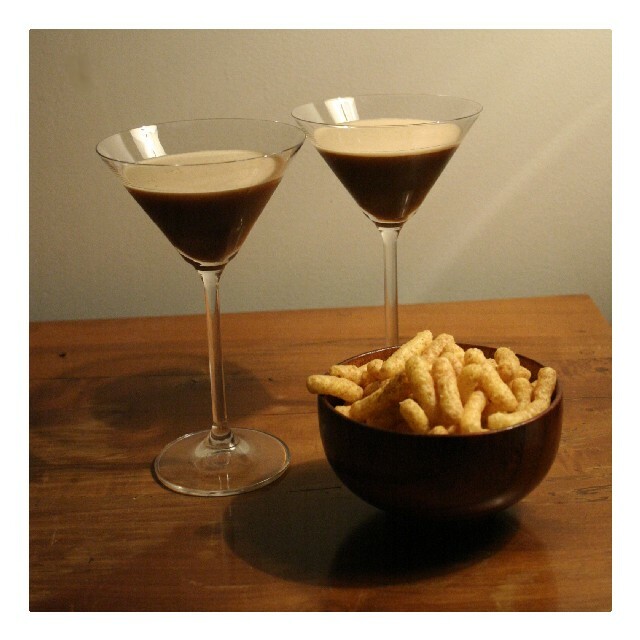 I asked a few colleagues of mine about serving Bamba and Champagne together and they thought it was a good idea! I am shocked. I figured if I even attempted to serve this at a dinner party here, they would take my citizenship away. I am going to try this and see what happens. Don't be shocked, my dear! Just accept it like many other facts of life, and most of all, enjoy it. Champagne goes with salty savory things very well, and that's just one of the many happy coincedences we discover along the way in this fascinating journey. Now about this Bamba thing. Now that you've opened this can of worms you have to clarify - because here in this country there are peanut flavored cheetoes, and there are peanut flavored cheetoes. Which kind is the one issued to each newborn in your country? Lunch was some pasta. 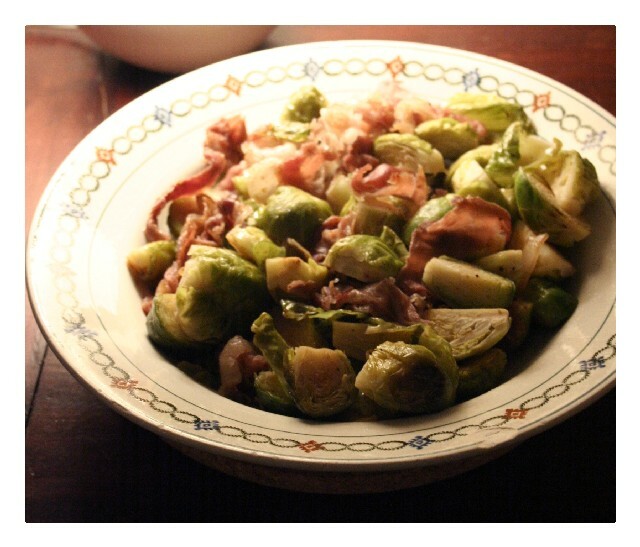 I doused it with a ladle of the yummy rabbit stock, and topped it with brussel sprouts which I had let sizzle in the pan with a torn up thin slice of cured ham. That was a pretty good lunch. I stole the ham from the good stuff meant for the terrine. There's certainly enough left for the terrine. Lucy, I will show you mine all in good time......... and I will fix the link above. It is not sweet and has some real peanut in it, so some parents are scared to give it to their children because they are afraid of peanut allergies. Some nurseries do not serve them as snacks anymore. Yum. Beautiful picture, Lucy...can't wait to see the terrine! I love the contrast between the domesticated and wild rabbit. What a great surprise to see Lucy blogging again. 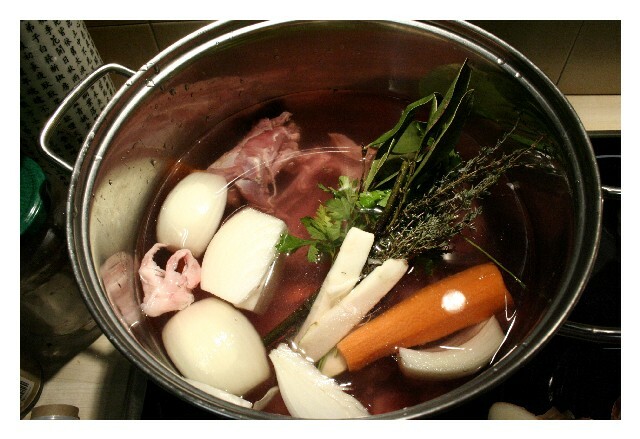 The photo of the gizzards confit almost brought tears to my eyes! (And certainly brought drool to my lips.) Looking forward to the terrine too. PS: I have never seen that Global boning knife before, it looks kind of... scary? Weird? Interesting. 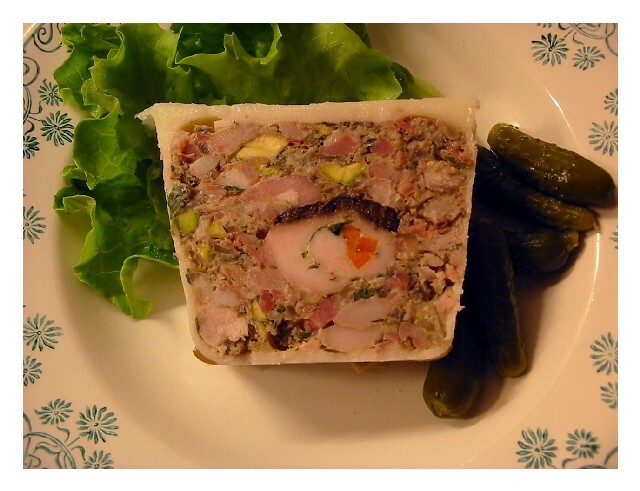 Interested readers may wish to revisit the Terrine thread in the Cooking forum. We could not wait any longer. By the way, this is a pic from a terrine that Lucy had made earlier this year. I'm so glad to see expat's making Thanksgiving. My first year here, I didnt bother with Thanksgiving and I found that I really missed it. So, this will be my 3rd time hosting a dinner for my Canadian inlaw's and friends. I know of no better way to introduce them to the ubiquitous green bean casserole( actually, I decided to not make it this year and instead I am making the entire meal from Cooking Light). Lucy, do you get fresh cranberries in France? I actually made some cranberry,cherry walnut conserve and I am surprised how easy it is. I cant believe I've never bothered making cranberry sauce before. Lucy my friends in Paris always love Pringles with champagne, we've adopted that here at home and our friends know that if we are popping a cork there will be pringles to be found most likely also. Good to see you blogging again, it's always a treat. The quest for bread is always a dire one on Mondays. I'd been drifting along through the neighbordhood searching for Monday bread, and finally stumbled on that place that makes a nice loaf called the "pain du bois" which is pretty good. I must be on the same schedule as this lady because very time I go (which is no more often than once a week), she arrives, with her baby in the stroller, and buys her bread just peeking her head through the door. No need to go inside. I had some lists to make and thinking to do so I went to a little place round the corner to do so. It's kind of a ladies place. The men who go there never really fit in. The lady bartender was playing cards with her lady friend, and another woman was having tea with her sacks from this afternoon's errands. They have an air conditioner in the summer but it makes more noise than it cools the place. It is a very special little nook that I like to go to now and again. 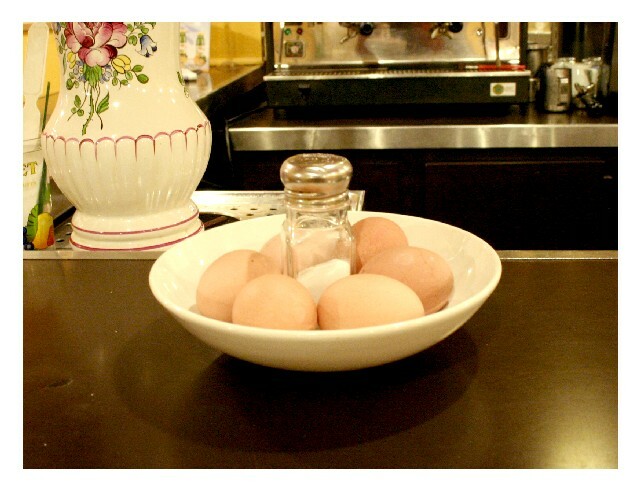 This is one of those old style places where you can stop in for an egg and no one looks at you funny. I got home and realized I had nothing for dinner. There was that half batch of dough languishing in the fridge, and some onions, shallots, garlic, leftover creme fraiche, some chevril, a couple of leaves of sorrel, and of course butter. That's something, so what if I don't have any leeks. 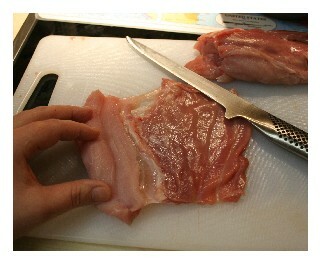 And those brussel sprouts which were so good with the ham at lunch, I decided to steal another slice of ham. By the time Loic came home something was in the works. Tomorrow I have tons of stuff to do and to get and the larder is going to be stocked with all kinds of great stuff. Since I FORGOT THE VEAL this afternoon, I have to swing by the butcher again and pick it up first thing tomorrow and get that terrine put together early so I can Fuggeddaboudit! (It is very strange but whenever I blog they are showing Al Pacino movies on French TV). Let me add my thanks to the many others here. Your writing is a joy to read. It's so nice to get back from Orcas, and back online, and find Lucy holding court. All hail the Queen of Blogs! I can't wait to see your Thanksgiving dinner. Add me to the bleudauvergne fan club. Lucy, I am awed by your artist's sensibility, which extends not only to the food and photographs here, but to every corner of your life... even insofar as choosing writing paper. You seem to come from a quieter era, when people had more time to reflect. Thank you for allowing us to peek into your life.